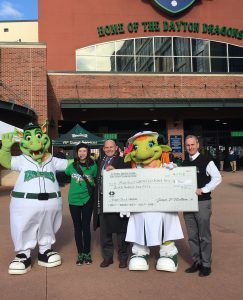 Pickrel, Schaeffer and Ebeling Attorney, Jeff Senney was given the honor of presenting $750 to Eric Deutsch (of the Dayton Dragons). The funds will go to the Alzheimer’s Association and support the Deutsch Team in the Walk to End Alzheimers. The donation is made possible by a PS&E Client who established a fund at the Dayton Foundation. The client named attorney Joe Mattera as the advisor to the fund and in control of donations. Additional personal donations have been made by Attorneys and Staff of PS&E to support the Deutsch team. Click here for more information about the team and the Alzheimer’s Association.